autumnal › Buy Poster of Autumn landscape with autumn tree in city autumn park under soft sunlight. Sunny autumn landscape of autumn park with golden autumn maple tree and sunlight breaking through the autumn branches. 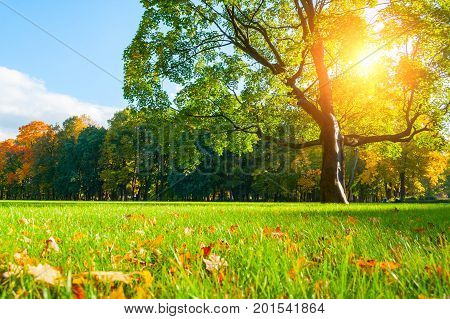 Poster of Autumn landscape with autumn tree in city autumn park under soft sunlight. Sunny autumn landscape of autumn park with golden autumn maple tree and sunlight breaking through the autumn branches.